Sleeping Beauty Turquoise & Blood Coral! This one is Sterling all the way, except a thin base plate of coin silver and the Belt Hook and loop. 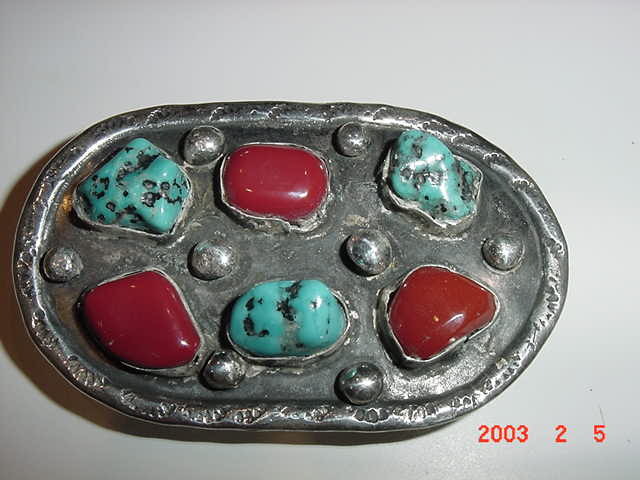 It has three Sleeping Beauty Turquoise Nuggets and three either Carnelian or Deep Blood Coral cabs that are set into a Handmade Sterling Bezel. It is further accented by Raindrops of Sterling and wonderful stampings of the Rising Sun around the perimeter. The overall measurements are 2 1/4" tall X 3 3/8 " wide. This piece was purchased from ‘dead pawn’ in Quartzsite, AZ in Jan 2003. The condition is Perfect. The condition is great! Yours for only $65 plus $6 shipping.